Barney and I had a great longe lesson with Kim Huffman yesterday! She is so patient and kind, as is my wonderful horse! The best thing about Barney is that he is an absolute mirror of my riding. 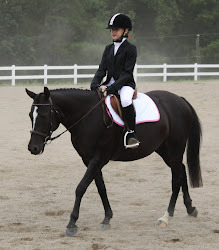 He is so in tune to the rider's body that he is a perfect reflection of what I am doing right or wrong. It is a wonderful feeling to know that you found the perfect horse for what you need, where you are, and where you want to go. If I just learn to breathe and relax, so many things will improve, both on and off the horse! Knowing that hasn't made it much easier to accomplish, but I'm determined to get there. Instead of a test reader at shows, I need someone chanting "breathe" to me - is that allowed?